Oh my. Could you box her up and send her to Denver, please? With her stand and fixin's, of course. 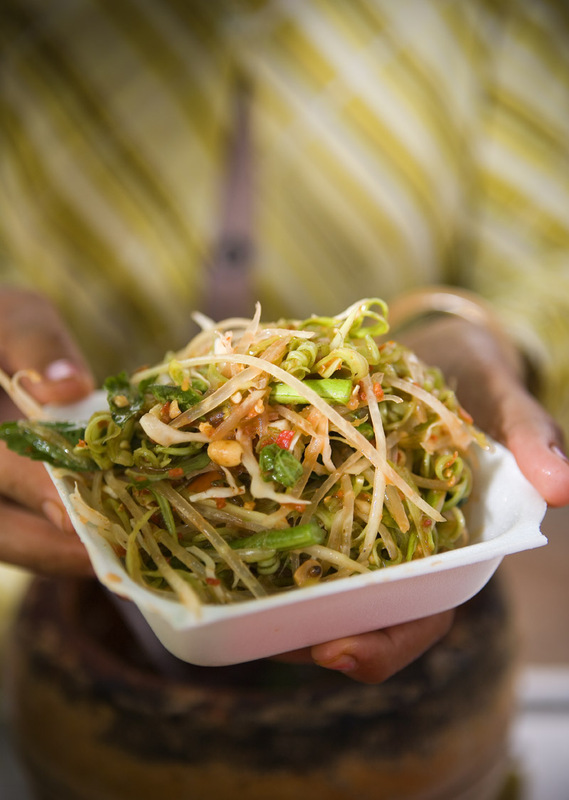 The salad is called bok lhong in Khmer ("bok" is a Khmer onomatopoeia for the sound made when pounding the salad; "lhong" is papaya). I think that despite the similarity, it has developed separately from Thai/Isaan food. 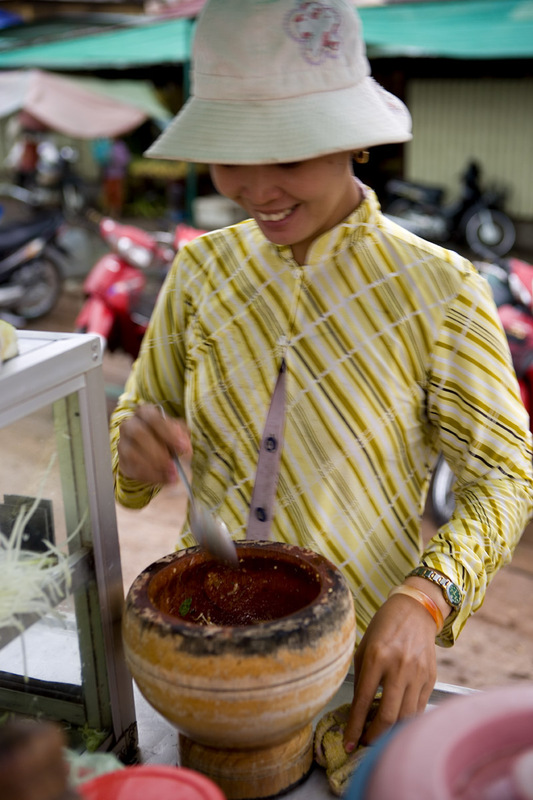 The further south that you go in Cambodia, the less likely it is to contain chili. It wouldn't surprise me if it's a dish that drifted from Cambodia into Laos/Thailand at some point in the past thousand years. The fish paste used is prahok, and occasionally smoked trei riel ("money fish") or smoked trei sleuk russei ("bamboo leaf fish") are also added, along with the rice paddy crabs (kdaam prei). I'm surprised anything was open at Psar Loeu at 3pm. I've always loved bok lhong, I think equally for the flavor and the soothing bok bok bok sound of mortar and pestle on a lazy afternoon. 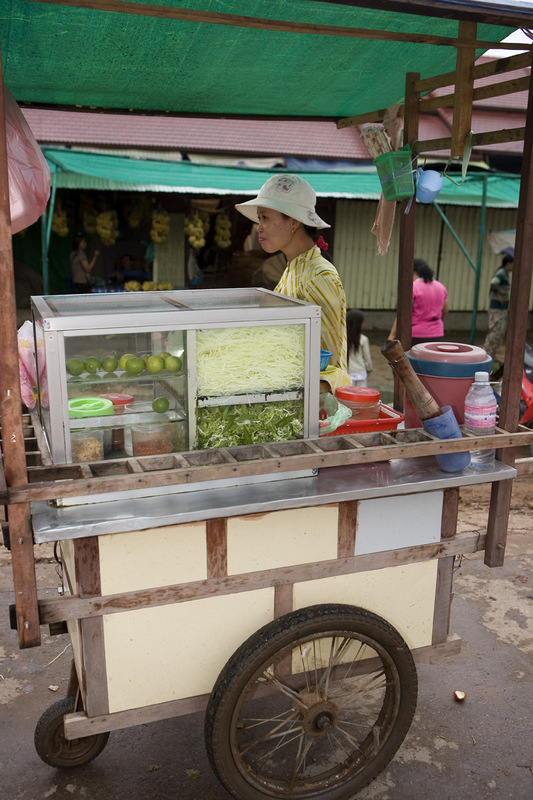 If you get a chance to explore the old market area of Siem Reap again, I do recommend it. There is some good food to be eaten amid the maze, as well as hole-in-the-wall restaurants that have been around far longer than the crowds. I have mixed feelings about it all. It's hard to see Siem Reap and the temples turning into a circus. Yet we have good Khmer friends who work in tourism and make far more money than they ever did back home in the village. 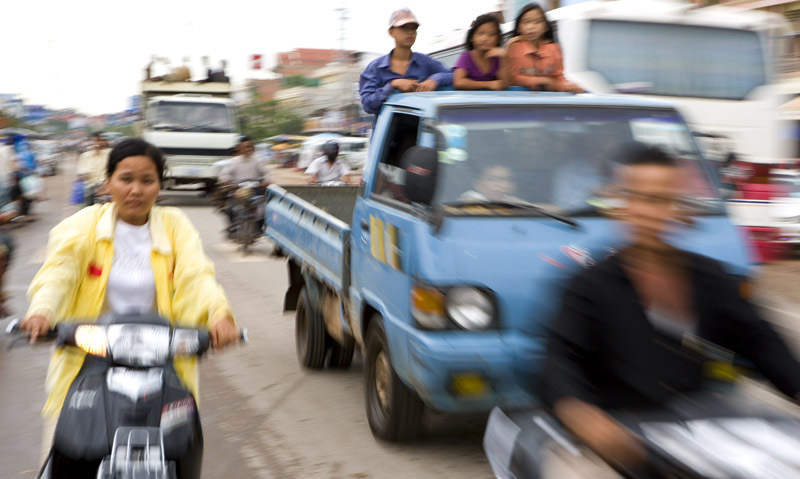 Unlike many Cambodians, they say life is looking better and they are accomplishing more each year. The circus might not look good to us, but I can't argue with Khmers who say they are happy to benefit from the tourists (while far too many Khmers do NOT benefit from the money dropped in Siem Reap... but that's another set of stories). Thanks Phil, for the name of the dish. I meant 'Khmerized' as in, in my own brain (my referent being Thai somtam), not literally. 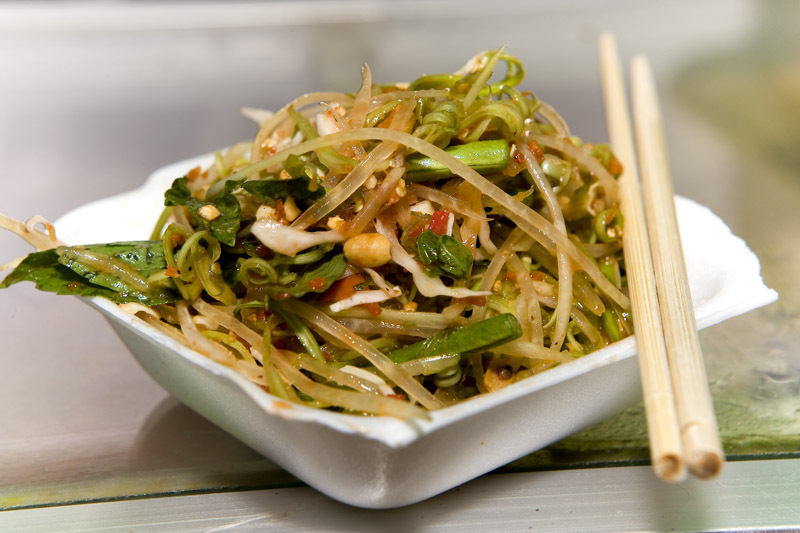 Just as I'm sure it would be difficult to argue a single SE Asian origin for sour soup I'm not sure you could pinpoint *the* origin of green papaya salad. At 3pm the market was quiet - only the smoked/preserved fish-meat section and the prahok section still open. And food vendors in the back and front. Hi Karen - we returned to the mkt in the morning and ate our way up and down the lanes, posts on that to come. I'm not arguing against the development of either the temples or the town for tourism. (Although it would be nice if more of the fees collected for entrance to Angkor went to locals.) And the businesses along Pub Street certainly won't suffer for our absence - most places were packed. But it's definately not my scene, and the vibe between tourists and Cambodians who work there seems a bit weird. Not at all what we experienced elsewhere. We'd rather head to a local beer hall or a stall in front of the market for our tipple. This looks so good that i really want to try making one at home!!! Pretty pictureS!! wow i can almost taste the freshness. god i miss all the zesty asian herbs and flavours. morning glory sounds like an interesting touch - is it the actual plant with the flowers?? i know they grow everywhere in singapore! mycookinghut - thanks. Yes, we're definately going to be recreating this once we get back to KL. cyn- for some reason 'morning glory' is what kangkung/water spinach is often called on restaurant menus in the US. So the stems are actually kangkung stems (no leaves). They have a wonderful crunch. 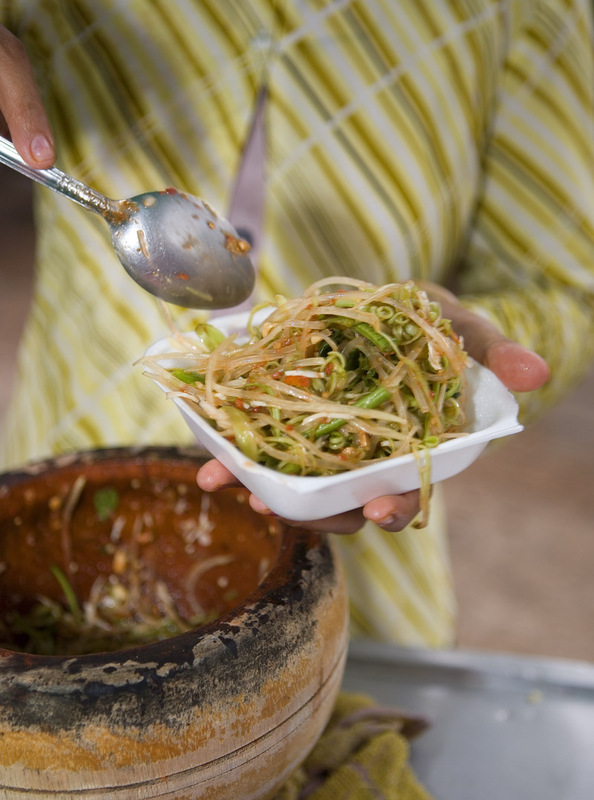 Robyn - I had been to Siem Reap and thought Cambodian food is pretty much a combination of Thai food with Vietnamese influences. I was very disappointed because I was hoping to sample something new there. I am not sure is it Cambodian food that influenced Thai food or otherwise since Khmer empire was ruling pretty much the whole Indochina, do you know? Hi Rasa - I think that Cambodian, Vietnamese, and Thai food all have quite a lot in common. But differences too. In our short time in Siem Reap we encountered many greens and herbs you wouldn't usually in Bangkok (but might in N Thailand) or Vietnam. 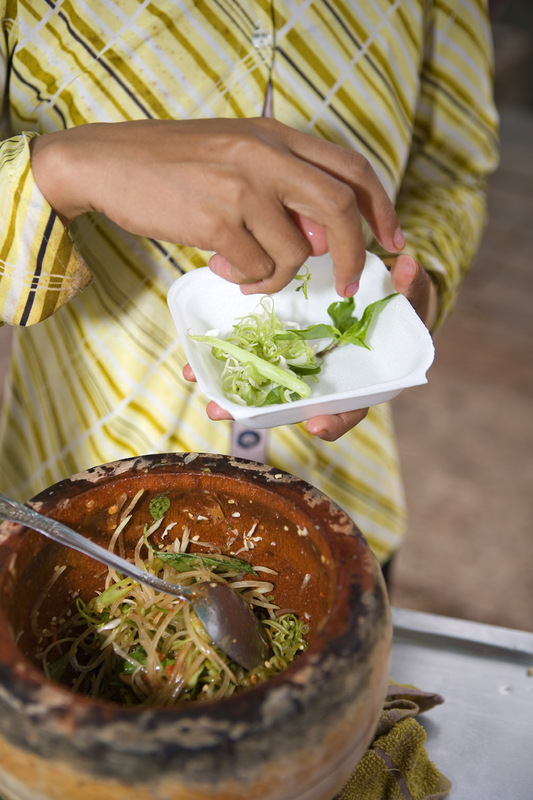 Everything we ate was something new, even if it had echos of Thailand or Vietnam. You really enjoyed the food in India, I recall ... certainly some echoes of Malaysia there? Same sort of thing. I'm intrigued by how certain dishes are found throughout upper SE Asia but in different forms, with various tweaks. Robyn - Sorry - I didn't mean to come off so shirty now that I read back my comment. I know we're batting for the same team. Rasa - having lived in Cambodia for three years, I share your disappointment with food in Siem Reap. Even if you're speaking Khmer (badly), it is tough to find amazing Khmer food in Siem Reap for two reasons: the food is dumbed down for tourists (on Pub Street and surrounds) and Siem Reap is the poorest province in the whole of Cambodia. There are certainly a few gems among the dross - both on the streets and in the classier restaurants - but they're tough to find. Hey Phil - no offense taken! And I hope you'll check in on upcoming posts to supply names for Khmer dishes. actually, there is a reason kangkung/phak bung is called morning glory. it is actually an ipomoea, just like sweet potatoes and, yes, morning glory. specifically it is ipomoea aquatica, and living here in thailand, i enjoy telling my thai friends when we eat phat fai daeng about how it's illegal to grow or sell phak bung in my part of the u.s., and how a small-scale black market has developed in the back rooms of asian grocers. Hi Josh - thanks for yr comment. That's really interesting! I never knew ... does it bloom at all, if left alone?